Masks is the very promising first novel of what’s shaping up to be a phenomenal series. And to think, at first I was tentative about approaching this book because (wait for it, silly irrational reason incoming) I was a little spooked by the cover! There’s just something so unsettling about the blank gaze of an empty mask, but I couldn’t deny there was a lot of beauty in this particular one too. Thinking back on it now, I realize that the cover for this book is actually quite perfect. The story it contains within is indeed quite beautiful, but it also has its moments of darkness, as a lot of these types of books with dystopian-like settings tend to have. Masks features Mara Holdfast, a girl growing up in Aygrima, a land overseen by the all-seeing Autarch. In this society, everyone is require to wear a mask the day they turn fifteen. Through these masks, it is said that the Autarch and his Watchers can know the thoughts of every citizen, enabling them to put down dissidents and maintain everlasting peace and security in the empire. Mara has known from a young age that she is Gifted; the magic that few are born with in this world runs strongly in her family. She has hopes to follow in her father’s footsteps and become a Master Maskmaker just like him, and looks forward to her masking day when she can finally become his apprentice. But then things go horribly wrong on her fifteenth birthday during the ceremony, and Mara is immediately labeled a traitor, not fit to be part of society. Everything Mara has ever known is ripped away as she is consigned to a wagon bound for the mines, where she will be forced into a life of imprisonment and slavery. This is a story that had me riveted from beginning to end. The introduction with the build-up to Mara’s masking ceremony is probably one of the best I’ve ever read, because it really does a good job of grabbing your attention right away. And as if that wasn’t enough, the journey doesn’t ever slow down, constantly driving forward as Mara is whisked from one dilemma to another. While there are some elements to this story that are predictable, the question of where the main protagonist will end up next is always in up in the air, and I was held rapt by the multitude of possibilities that could happen. 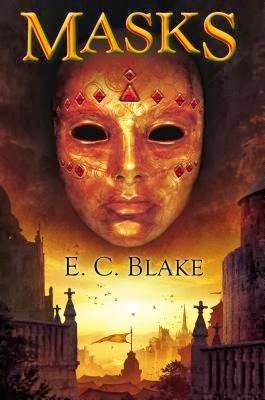 I was also struck by the magic in this book, which goes hand in hand with my fascination with the idea of the Autarch using masks to control the population. At this point, not everything about the masks and magic is explained yet, and while I do have many questions, it also feels like the author is leaving lots of room to flesh it out in the next installment. Nevertheless, what’s established here already gives this book a certain uniqueness, and I’m excited to know more. I’m also very much looking forward to the character growth of Mara. If there’s one thing I wasn’t particularly fond of about this book (and it’s a tiny thing), it was her constant questioning and second-guessing of herself. She also tends to dwell on things and appears to have the weakest stomach of any character I know, leading to a few instances of repetition in the narrative and a lot of vomiting on poor Mara’s part. On the other hand, I realize she is barely fifteen and has lived a relatively sheltered and privileged life before everything in her world turned upside down. In that sense, I really can’t fault her all that much. I expect there’s a lot potential for her in the next book though, as she develops into someone in a leadership position who has the ability to change things for the better. I did ask myself after reading Masks whether or not I should categorize this book as Young Adult. The age of the protagonist along with certain factors like the not-so-subtle hints of a future romance or love triangle makes me want to say yes, and certainly I think the story could appeal to older teens. At the same time, the nature of the fantasy setting and characters that E.C. Blake has created sets this book apart from conventional YA, and so I think a wider audience can appreciate it too. I know I did…a lot! A review copy of this book was provided to me by the publisher in exchange for an honest review.